Every morning, as New Yorkers across the city frantically search for their Metrocards, run to catch an express train, and elbow their way into crowded subway cars, 75-year-old Alvin “Lee Lee” Smalls arranges a mechanical fan to peek outside of the door of his Harlem bakery, blowing out the sweet scents of freshly baked buttery pastries to entice busy passersby to stop and smell (and hopefully buy) his rugelach. One of the downfalls to having a storefront on a peaceful, tree-lined Harlem street is the lack of foot traffic, which Smalls (or “Mr. Lee,” as neighbors call him) aims to compensate for with his version of an olfactory megaphone. “People smell it,” Smalls assures me as he inhales the sweet, sugary scent inside his 118th St bakery. Smalls isn’t trying to invent the next Cronut®. He’s not aspiring to become the next big Instagram sensation, nor the type of chef that makes media rounds. “Now, everyone’s trying to be on TV and be a celebrity and [sell] boxed mix and all that,” Smalls declares. “Not me.” Despite the dozen or so media clippings and various accolades framed and displayed across the bakery’s floral wallpaper, Smalls says some press, mostly from 2001, when he opened Lee Lee’s Rugelach By a Brother, hasn’t given him a “big head.” For Smalls, it’s just about the baking. 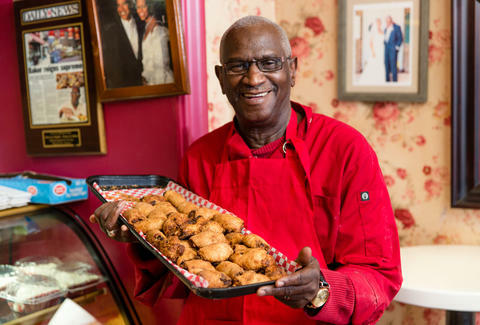 Smalls grew up in Georgetown County, South Carolina -- the same town where Michelle Obama’s father, Fraser C. Robinson III, grew up, he says, gesturing proudly to a framed picture of the Obamas hanging over the pastry case. After graduating from high school, he moved to Myrtle Beach and spent two years working in fast food, before moving to New York City with his brother and sister in 1962. After practicing at home and shadowing his co-workers, Smalls ended up mastering all of the various kitchen jobs at the hospital. By the time he was ready to leave to start his own bakery, the South Carolina transplant with “no real cooking background” was the head pastry chef at a major hospital. 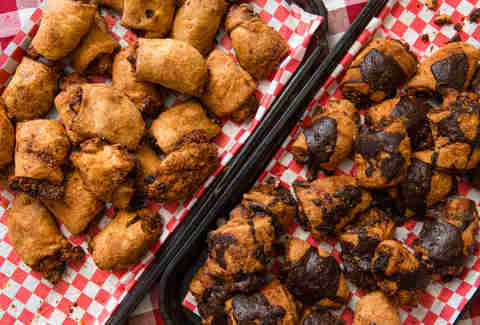 Smalls had never had rugelach -- a bite-sized Ashkenazi Jewish flaky pastry, swirled with fillings like chocolate or cinnamon sugar nuts -- until working at New York-Presbyterian (“they don’t have that in the South,” he says) but he fell in love with it immediately. In 1964, he saw a rugelach recipe in a newspaper and set it aside, only to find it again in the late ‘70s. Smalls began to play around with the recipe, adding and swapping out ingredients as he would with other recipes he learned at work. “The recipe was there, but I changed it around, played with it, I added a lot do it, and I’m blessed it came out this way,” Smalls says. Some modifications included swapping out sour cream for cream cheese and using real butter instead of margarine. Smalls won’t share more of his baking secrets on the record, but he says the key is using high-quality ingredients, like his “special flour,” (he won’t say what it is), good walnuts, and pure apricot jam for filling, building on traditional fillings but with his own twist and emphasis on quality ingredients. In 1988, after perfecting the rugelach recipe, Smalls opened his first bakery -- Marion Smalls Bakery (named after his father) -- on Amsterdam Ave. 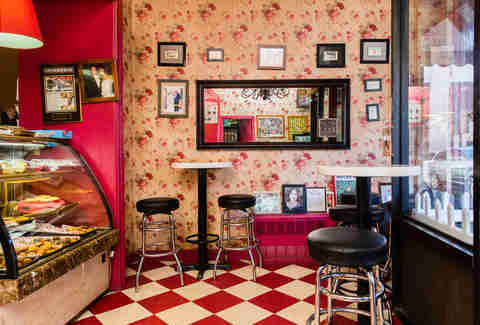 The bakery quickly became known for the buttery, crumbly rugelach, attracting neighbors and a roster of celebrity fans, including Mike Tyson. Though Harlem had been a booming Jewish neighborhood at the turn of the 20th century, by the 1930s, most of the Jewish population had dispersed to The Bronx. By 1988, a crack epidemic had devastated the once culturally robust neighborhood and left countless Harlemites homeless. Even so, residents remained loyal, supporting local businesses and public spaces as best they could. As both a reminder of the neighborhood’s Jewish past and a symbol of the present-day mom-and-pop shop, Smalls’ bakery fell at the intersection of both Harlems. Following two spine surgeries in the early ‘90s, Smalls was forced to close Marion Smalls Bakery. Shortly after recovering, however, he was ready to start again -- this time with Lee Lee’s “Rugelach By a Brother” on 118th St. Unfortunately, the bakery officially opened its doors on September 12, 2001, a day on which even baked goods couldn’t help heal a grieving city. In the weeks following 9/11, business was slow. At the time, Smalls’ Harlem block was “just abandoned buildings and fields,” he recalls -- nothing like the specialty coffee shop and luxury condo-covered blocks that now surround Lee Lee’s. Affordable rent wooed Smalls into the less-than-prime real estate for his new bakery. After that, the rugelach gradually started selling, mostly to patients at the methadone clinic on the corner and people Smalls knew from working at the hospital. “The only thing that kept me going was the methadone clinic... [I] didn’t get much business at the beginning,” Smalls says. Lee Lee’s became a destination for New Yorkers and tourists to load up on traditional baked treats, made with real butter. Word eventually began circulating throughout the city. By the early 2000s, Harlem and the rest of Manhattan's old-school bakeries were replaced by speciality pastry shops where a single shipped-in macaron cost five times as much as a homemade Lee Lee's rugelach, and Smalls was reaping the benefits of this change. His bakery became a destination for New Yorkers and tourists to load up on traditional baked treats, made with real butter. Smalls started getting requests for mail orders, even shipping packages to places like Morocco and getting visits from European tourists. Smalls, who does not speak French or German, has seen his bakery in guidebooks in those languages. “A lot of people come from different places,” he says of his diverse clientele. On a recent Friday afternoon, everyone from local Harlemites stopping in for a quick snack, dinner party, or, presumably, Shabbat dinner, stocked up on the dwindling supply of rugelach; a city worker dropped in for a coffee and a piece of rugelach; a neighbor came by to negotiate the rate on a custom cake. It’s clear the beloved “Rugelach by a Brother” is a common ground for all different kinds of people. Smalls only wishes he could get more foot traffic, but the rent is too high for him to relocate onto a main street. When the methadone clinic closed in 2010, Lee Lee’s took a major hit -- a good portion of the business relied on the patients and workers who visited the clinic and bakery regularly. But Smalls, who at the time was 68, wasn’t ready to retire. Smalls somehow managed to stick it out, and in 2015, a business partnership with Ben Neschis, a lawyer, and Scott Schuster, a brand manager, completely revived the bakery. Schuster, whose grandfather grew up in Jewish Harlem, was visiting his family’s old neighborhood one day when he stopped in to Lee Lee’s to try the rugelach. ”I’ve been to bakeries all over the country, and nothing compares to this rugelach,” Schuster says. He wanted to leave his “compliments to the chef” and was encouraged to venture back into the kitchen, where he met Smalls, and a business partnership soon kicked off. With the business boost from his two partners, Smalls hopes to open another bakery back in South Carolina, where he says you still can’t find anything that even looks like rugelach. And unlike his Uptown bakery, Smalls’ Southern space will have another major perk: air conditioning. On New York City summer mornings, Smalls has to do all his baking before the sun comes up, or else the butter softens and his dough does not come out right. But for now, Smalls, who wishes he was “30 years younger or 30 years old” to enjoy his brand’s growing success, still works every day, estimating he’s made at least a billion rugelach in his lifetime (the bakery sells well over 1,000 handmade rugelach on weekends). He now sits, rather than stands, while making it, but notes that he still loves doing it. “I can still get up and feel good coming to work -- it’s just something I like doing,” Smalls says. Melissa is a writer based in New York City who was raised on a diet of rugelach and matzo balls. Follow her on Twitter.